Hollywood's idea of a horror movie has fallen so far away from frightening that they might as well come up with a new name for the genre. With the likes of The Lazarus Effect, Poltergeist, The Gallows, and Paranormal Activity #62 all being released in 2015, it might not be much of a stretch to say that we're at an all-time low when it comes to horror movies coming out of Hollywood. As such, it's time for us to look elsewhere. "Elsewhere," at least for the purpose of this article, is Romania, where we find Adrian Tofei, the director, writer, star, producer - and likely almost any role involved in its production - of Be My Cat: A Film for Anne, a title so intriguing that I made it a priority to watch it. 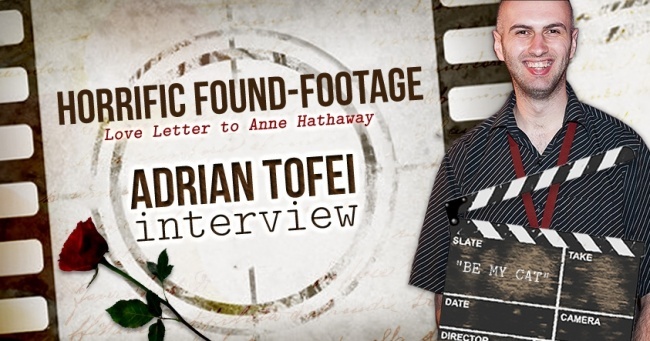 Adrian was kind enough to answer a few important questions about his film, such as the most obvious: What exactly is Be My Cat? It's a movie about a guy in Romania who goes to extremes to convince actress Anne Hathaway to play in his film. 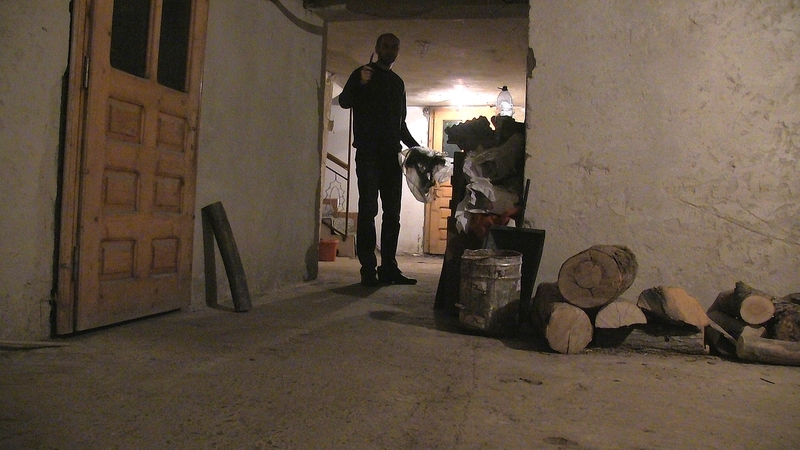 And it's also Romania's first found footage horror movie. But spoken in English, since it's addressed to Anne. That's certainly an interesting idea for a movie, although it doesn't exactly scream horror - especially not at first. As the movie opens, all you have is a fan of an actress making a video he hopes she'll notice in order to have her star in another movie. But as it progresses, it becomes something far, far more. As mentioned above, Adrian starred in the movie - in addition to all of those other roles - something that was an interesting experience, to say the least. Adrian has a wonderful perspective when it comes to playing a character. A character is just a psychological identity or ourselves. We all have different psychological identities in real life. We're born with certain psychological traits, but our life experiences shape those traits. They suppress some of them and they highlight others. But we have different environments to experience life. At our job we behave in one way because of years of life experiences in social situations that shaped our social identity. That identity even has an official name. Mr. Anderson, for example. But when we're at home with family, we behave in a different way because of years of personal and intimate experiences that shaped our intimate identity. That identity even has a different name. Andy instead or Mr. Anderson. So, you see, we all play different characters in real life. When working on a role, the actor has to have some new life experiences to help him shape a new identity - his character in the movie. The only difference is that the fictional character is often so different from our real life characters we play daily. And that character gets to manifest only in fictional circumstances during filming. In the rest of the time it's not quite living in character. It's half living. You experience most of the things indirectly, using a lot your imagination, watching movies and documentaries, listening to music and reading. Adrian's character in the film wasn't the only one in the entire picture, though. The premise has him shoot other actresses in order to show how good of a director he is, so that Anne Hathaway will agree to star for him. But when a film has this many "roles," as well as improvisation and a meta element, working with only a select few people can prove challenging. Every moment was a challenge. We didn't have a written script, we fully plunged into our characters and improvised on the basis of months and months of previous preparations, when I did everything possible to create the psychological and practical circumstances that would lead during filming to what I had in mind for this movie. So practically, I knew that what will happen during improvisations will be exactly what I need in the movie, since I worked months on controlling all those circumstances, but I didn't know the details of what will happen, so every second was a challenge. And the fact that I played a director and the actresses Sonia Teodoriu, Florentina Hariton and Alexandra Stroe played actresses in the movie, and more than this, that director played another guy is the scenes he was shooting and the actresses played another actress in those scenes. And since we didn't have other crew members present, it was a dangerous psychological situation. We had a language switch to differentiate the situation when I was giving instructions to the actresses and the situation when the director I was playing was giving instructions to the actresses that they were playing. Whenever we switched from Romanian to English, that was a sign that we plunge into our characters. But then ... our characters also played other characters ... so, yeah, it was a psychological roller coaster. Adrian and his stars even got so into their characters - and their characters' characters - that he doesn't even view himself as the director. I didn't direct. My character in the movie directed everything. I partially lived in character for a year before shooting and while shooting I fully plunged into my role and directed everything while in it. His goal was to convince Anne Hathaway to come to his town in Romania and play in his film. So he did everything possible to convince her of that. The majority of the directorial decisions were his decisions, not mine. A found footage film is fueled by the goal of the character who films everything. Only the actor with that character's personality and goal assumed, can decide what to do with the camera. Otherwise, if somebody else makes directorial decisions, they are not realistic enough for the found footage filmmaking concept, they cannot be consistent with that character's personality and goal. If a found footage film looks directed, everything is ruined.